Although a rare breed, the Alaskan Klee Kai makes an exceptional pet that is loyal and affectionate to their families. These dogs are a small version of the Alaskan Husky with similar features including a wedge-shaped head with striking masked face, pricked ears and symmetrical markings. The Alaskan Klee Kai was bred directly from Alaskan Huskies, Siberian Huskies, American Eskimo Dogs and Schipperkes and their appearance certainly reflects this Northern heritage. This breed of dogs is protective of their family but wary of strangers, which does not make them good guard dogs. They are good watchdogs, as they like to bark. The Alaskan Klee Kai has a high drive for prey and a fastidiousness that many say resembles a cat. This breed has three different sizes – Toy, Miniature and Standard – all with the beautiful double coat and unique well-furred tail that curls over the dog’s back or side. It is suggested that these dogs experience early socialization in order to better get along with children in the future. The Alaskan Klee Kai is an affectionate and loyal little watchdog that is full of energy and active curiosity. They are loving toward family and friends but cautious of strangers and may not get along well with children. Socialization is required. These dogs are adaptable to training, but they may not always obey you. They can be pack oriented and enjoy running, so they should not be trusted on their own. Alaskan Klee Kais are prone to chewing things or digging when they become bored or curious. With the beautiful coat of the Alaskan Klee Kai, frequent brushing is recommended to remove shedding or dead hairs. Baths should only occur when necessary and are not recommended more than twice a year. 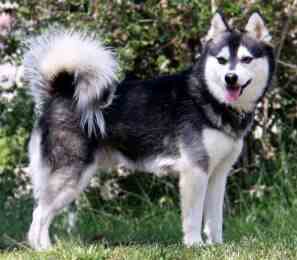 The Alaskan Klee Kai is a rather healthy dog breed with no known health problems. These active little dogs should get regular exercise and be taken on long daily walks. Because of the small size of the Alaskan Klee Kai, apartment living is possible but a house with at least a small yard is ideal. Alaskan Klee Kai puppies and dogs can be rather shy and cautious about new things making early socialization a must. Training this breed when young can make them more accepting of other people and possibly children. The best behaved Klee Kais come from puppies that are raised with a lot of socialization and interaction with new people or situations.